Glad you're doing this contest again. My picks are: Rangers/Lightning and Blues/Ducks for the final four. Cup final is Rangers/Blues with the Rangers winning in 6 games. My Twitter handle is Metalleaf24. Good luck to everyone. Penguins over Blackhawks, with the Lightning and Canucks losing in the conference finals. Why not? Let's see, you said until Friday so I'm in. I'm going for the Pens (gotta be hopeful) against the Lightning and the Ducks against the Blackhawks. The Stanley Cup will be Pens v Ducks and the winner will be the Pens. hahaha. Love your contest. My twitter handle is plumberbuzz. Great artwork! No predictions, I'm not hockey savvy enough. I'm just glad you finally drew a Flames girl! :) Nice work! Why do you represent the teams with your idealized vision of a female in a seductive pose & barely dressed? Men and women are both fans of the game, so why not draw pinups of men? I do...though admittedly not as often. It basically comes down to two things: Pinups of women sell about 1000x better than pinups of dudes (at least in my experience), and, frankly, I'm a straight guy, and I enjoy drawing pinups of women more. I'll draw just about anything a paying client will ask for, but when I'm drawing pinups for ME, as I am with most of the hockey stuff, I'm more than likely going to be drawing women. 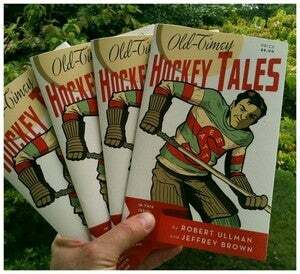 Have a look at my Old-Timey Hockey Tales comics, or my Atom-Bomb Banana Hammock collection...plenty of dudes to see!